Martin Redish, MD, orthopedic surgeon with Parkridge Bone & Joint, has performed approximately 2,500 partial knee replacements during the past 18 years. He uses the Repicci Method for partial knee replacement, which borrows techniques from dentistry to achieve excellent outcomes in postoperative pain, recovery times and durability. 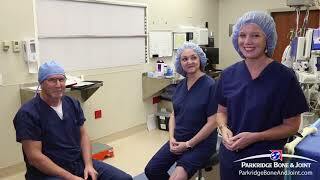 Here, Dr. Redish explains and demonstrates the differences between partial and total knee replacement. To learn more about joint replacement or to schedule an appointment, call Parkridge Bone & Joint at (423) 493-5220.